There are many perks to being a book blogger, especially being contacted by publishers with titles you might not otherwise discover. 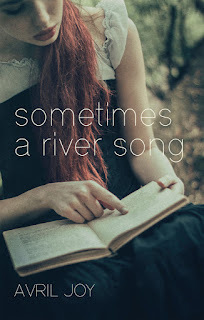 All this is to say thanks to Linen Press for sending me a copy of Sometimes a River Song by Avril Joy in exchange for an honest review. When I began reading this short novel and was introduced to the strong and distinct voice of protagonist Aiyana Weir, a young woman living in a river boat community in Arkansas in the 1930s, I was hooked immediately. Her voice was so melodic, her less than perfect English, compelling. The book follows the story of Aiyana and her life with an abusive father in a close knit community. The odd one out in the family, and rumoured to be the child of another man, she has never been allowed to go to school like her brother Lyle, and sister Hetty. She develops a fixation on learning to read in an attempt to gain her independence and free herself from the brutality of her father. There is a wonderful musicality to Aiyana's voice as she talks of the moons and the river. I could feel the shift in the seasons as I was reading, so vivid is the prose here. While Aiyana is the central character, the story of Silas is told with equal skill and the uncovering of his secrets added a great deal to the depth of his character. Indeed, the story seems to simultaneously lilt and drift but it is nevertheless, an interesting plot. In a world dominated by men, Aiyana is a fresh voice, determined to find her way to a better life. The relationships between women, particularly between her and her beloved Grandma, are well crafted and it was a pleasure to be presented with these strong female characters. By the end I felt I truly knew Aiyana and wished with everything that she be able to set herself free. A book about identity and secrets, I would not hesitate to recommend Sometimes a River Song; it is an original and compelling work.